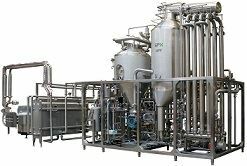 The SPX Flow Infusion SDH UHT plant. Interpack is taking place from 4 – 10 May and highlights at this year’s show will include separators, homogenizers, mixing technology, UHT solutions, butter making and fresh dairy processing technologies with specific focus on separation free, environmentally-friendly technologies that guarantee that high-value fresh fermented dairy products and spreads are 100 % natural. SPX Flow homogenizers are built to enhance texture and taste, control particle size and uniformity and control viscosity to ensure high quality products with increased shelf stability. The full range of mixers available can handle products from processed food to beverage, dairy and personal care products. When it comes to UHT solutions, SPX Flow offers a choice of technology including direct and indirect heating to match application requirements. It includes systems such as Instant Infusion which gives gentle, high temperature pasteurization with efficient spore inactivation and bacteria kill rate. Instant Infusion technology can be used with high viscosity product lines and protects desirable product characteristics. SPX will be at Interpack 2017, in Hall 3, Stand E23.